"Nothing brings people together like a crappy summer job." The summer of 1987 is just the beginning of adulthood for James Brennan. He has just graduated from college with a degree in literature and has hopes of going to graduate school in the fall. He has plans of touring Europe for the summer when his parents let him know they can no longer financially support him. With hopes of Europe out the window, he is forced to get a job. He finds one at the local amusement park, Adventureland. A summer of misadventure and lessons in love ensue. Working in the games section, he meets Emily Lewin, aka "Em." After she saves him from a frustrated and violent customer, she invites him to a party at her place. At the party it's revealed that Em has been having an affair with the amusement park's married repair man, Mike Connell. After the party they go to a bar to get a drink, where James reveals that, even after college, he is still a virgin. Connell shows up at the bar, so James and Em leave. By one of the city's bridges they kiss, but the next day, Em tells James she wants to take it slow. Feeling rejected, James agrees to a date with another co-worker, Lisa P. After his date with her, he learns that Em has called to tell him she regretted saying she wanted to take it slow. Some more misadventure with angry customers ensue, then James' friend and co-worker Joel decides to quit after seeing Em and James walking together. He's angry at James for going out with Lisa P., when he clearly has feelings for Em. 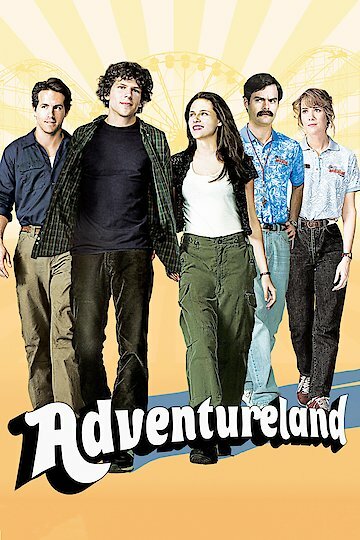 Adventureland is currently available to watch and stream, download, buy on demand at Amazon Prime, Showtime, Hulu, Amazon, Vudu, Google Play, iTunes, YouTube VOD online. What if you're a sleeper agent and you just don't know it yet?